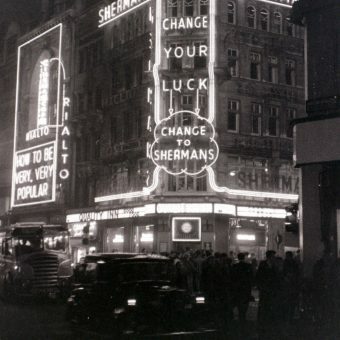 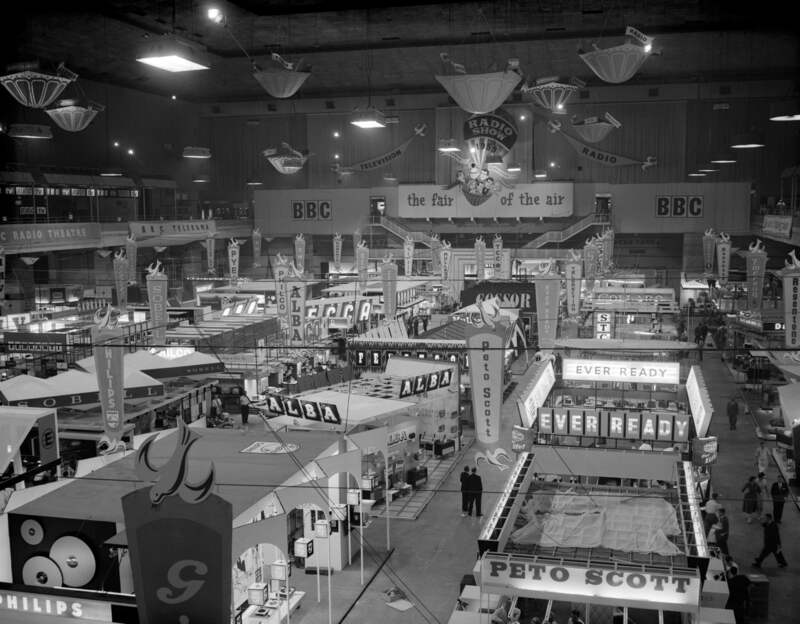 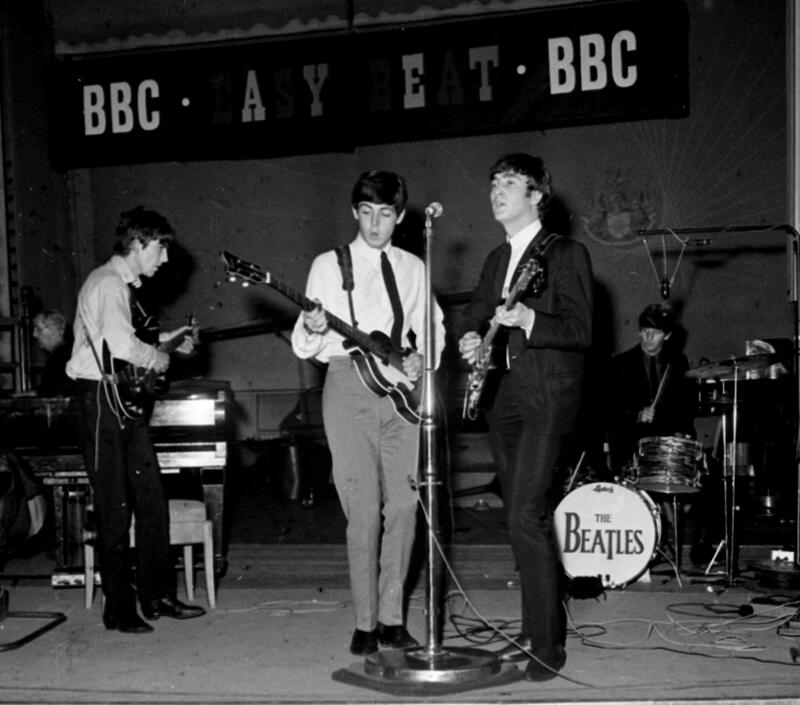 The BBC’s radio services began in 1922 when the British Government licensed the British Broadcasting Company through its General Post Office, which had original control of the airwaves. 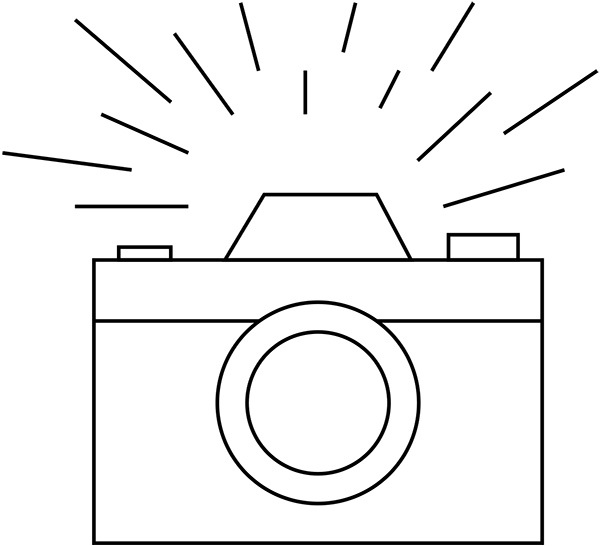 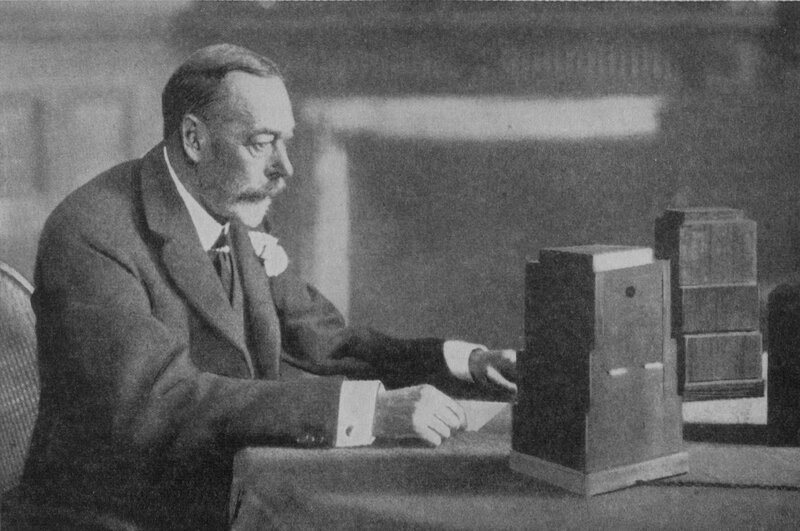 However on 1 January 1927 it was succeeded by the British Broadcasting Corporation, under the terms of a Royal Charter. 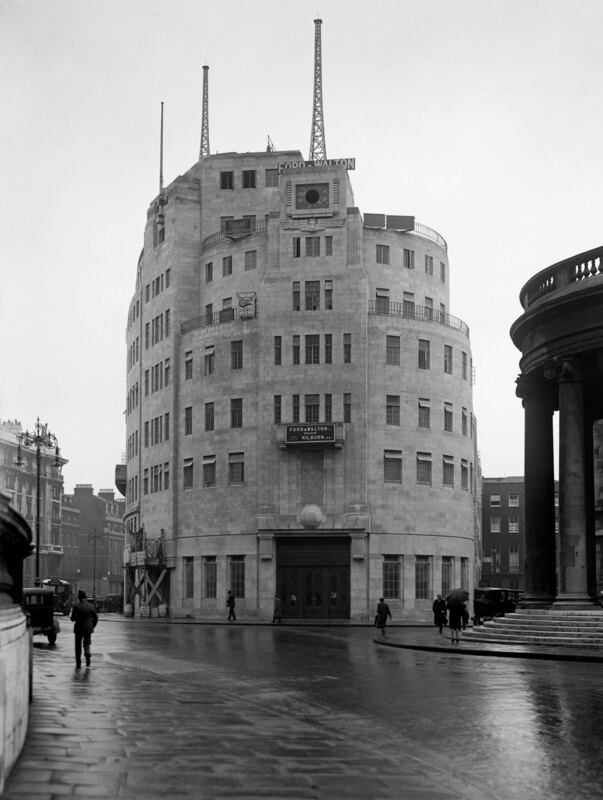 1931: A view of the newly-built BBC Broadcasting House in a wet central London. 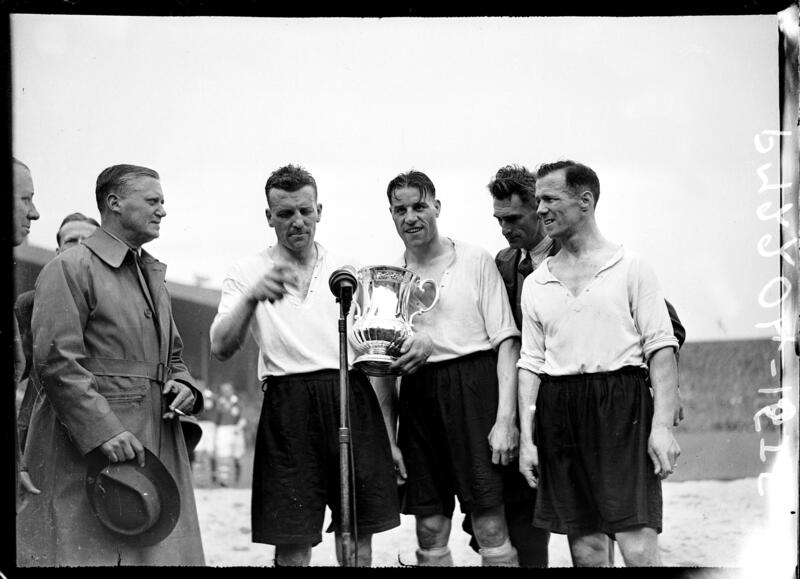 Derby County captain 36 year old Jack Nicholas (second left) steps up to the microphone with the FA Cup to give his opinion on his team’s extra time 4-1 victory 27/04/1946 – The players in the 1946 Cup final were awarded two medals each. 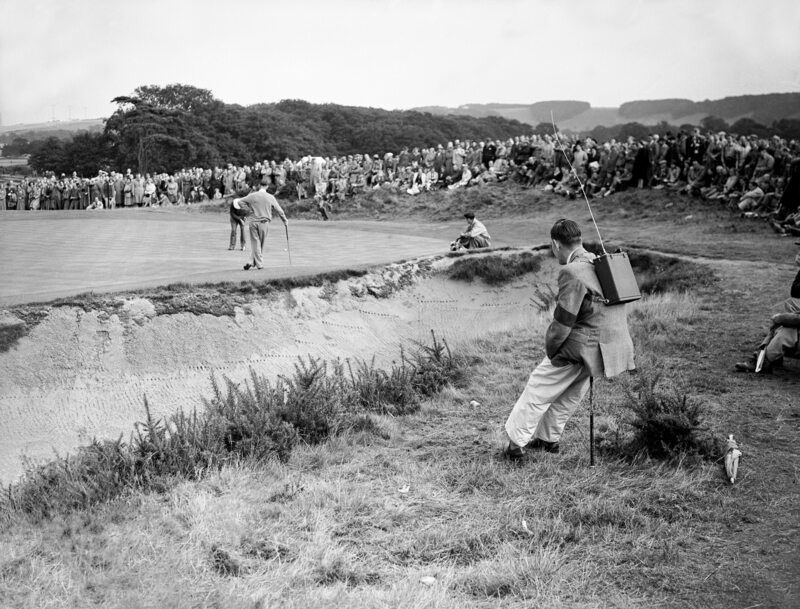 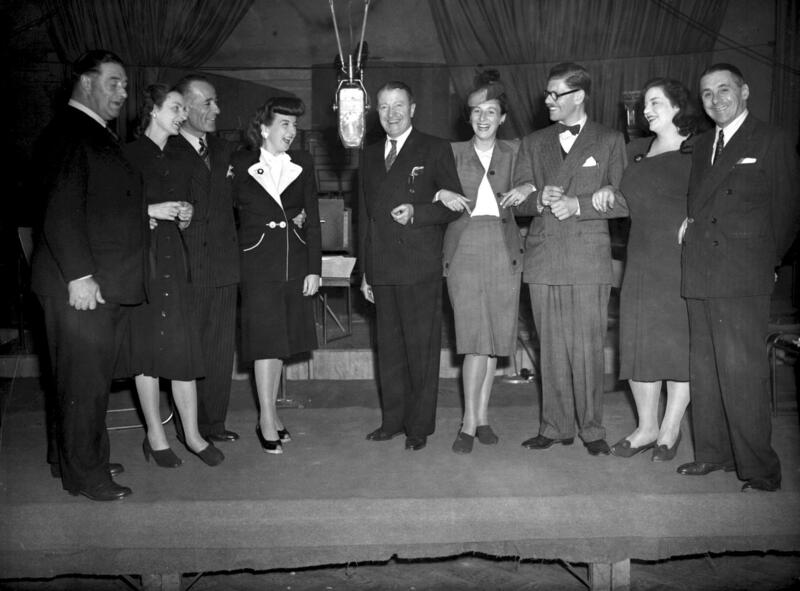 Due to a shortage of gold following the Second World War, the two teams were initially presented with bronze medals (winners and runners-up) on the day, and subsequently awarded the gold versions when gold became more readily available later that year. 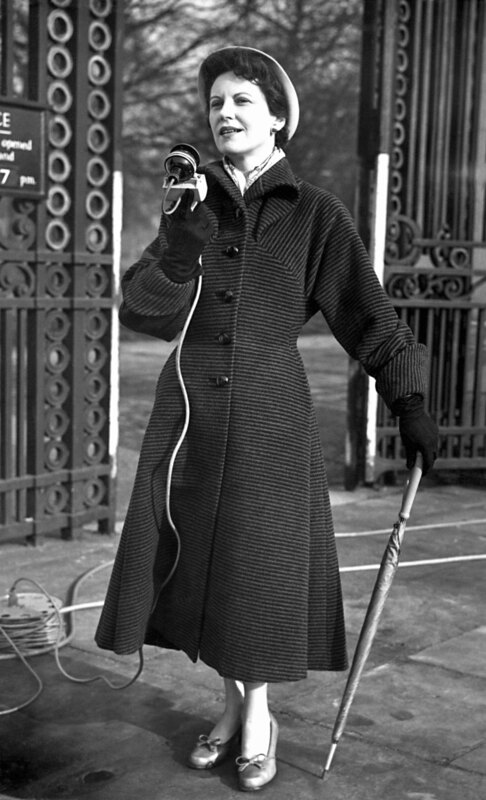 London Olympic Games 1948. 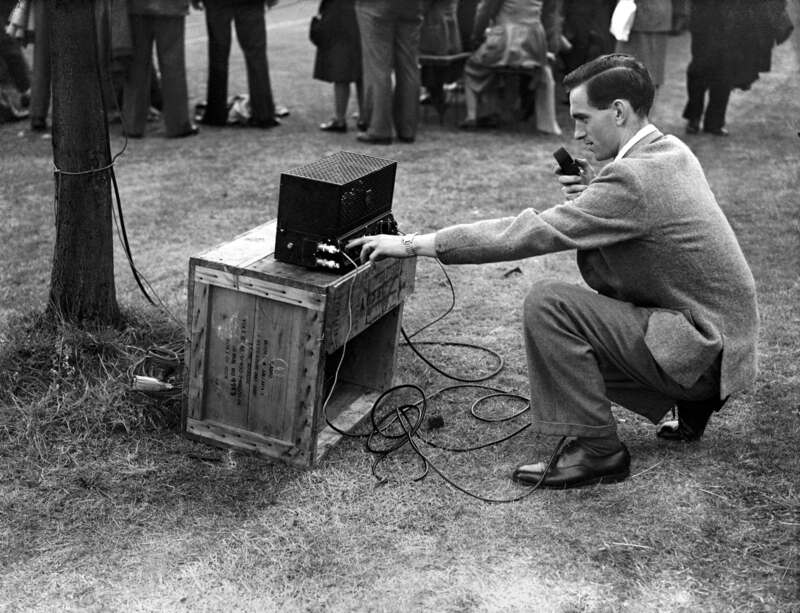 A radio outside-broadcaster prepares his equipment. 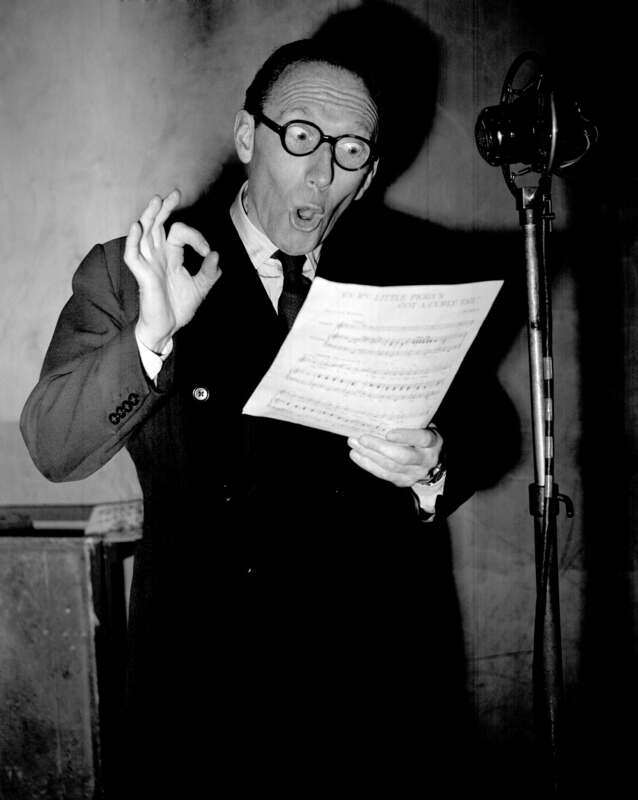 The popular radio and stage comedian Arthur Askey at the microphone to sing ‘Ev’ry Piggy’s Got a Curly Tail’ at the EMI Studios in Abbey Road, north west London. 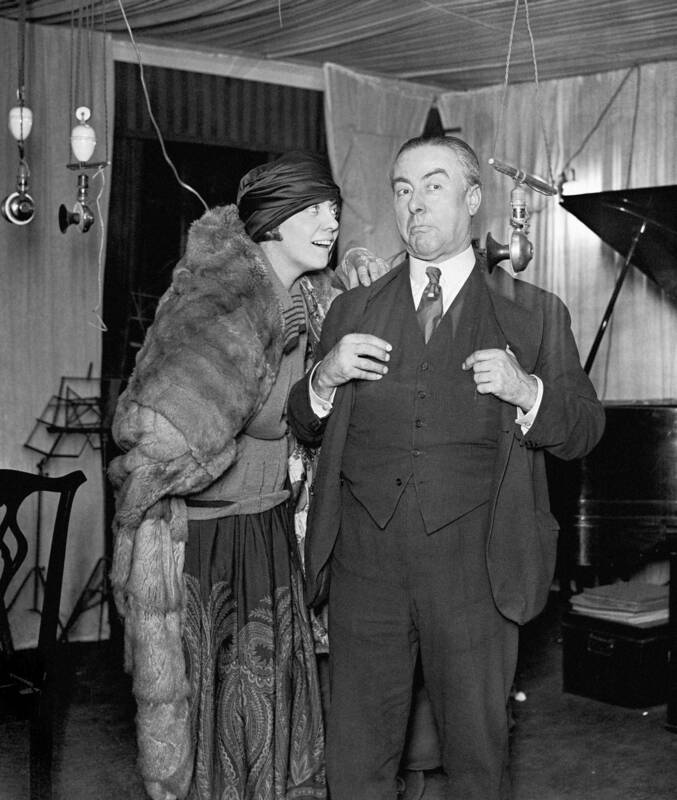 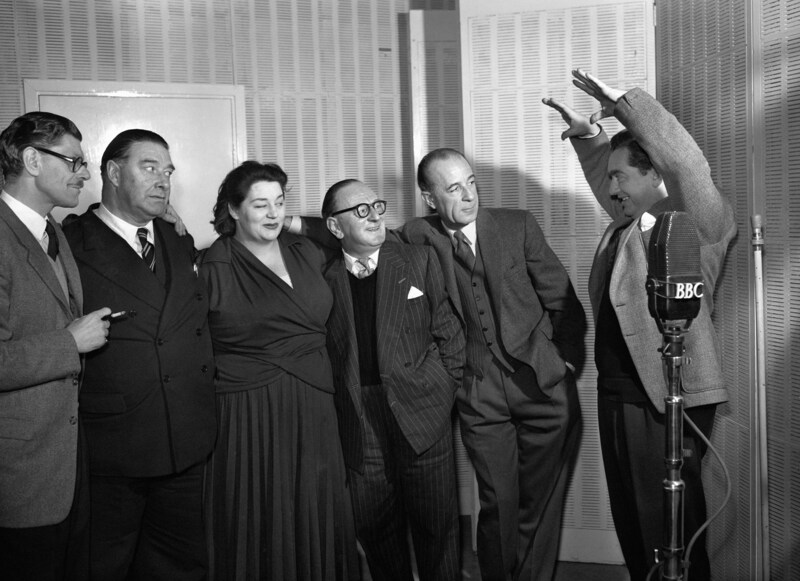 From left to right: Fred Yule, Joan Harben, Hugh Morton, Lind Joyce, Tommy Handley, Diana Morrison, Derek Gyler, Hattie Jackes and Jack Train during rehearsals for the radio show “ITMA” in London. 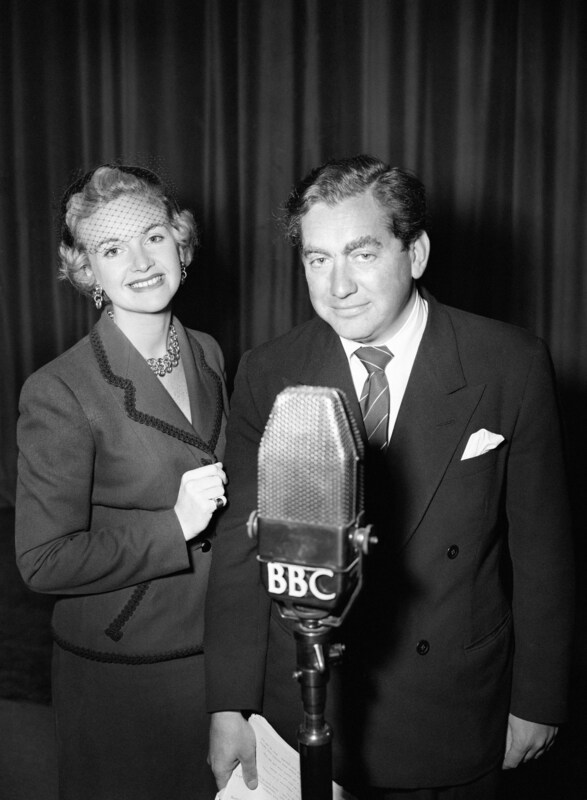 The title ITMA (It’s That Man Again) referred to a contemporary phrase concerning the ever more frequent news-stories about Hitler in the lead up to the Second World War and specifically a headline in the Daily Express written by Bert Gunn. 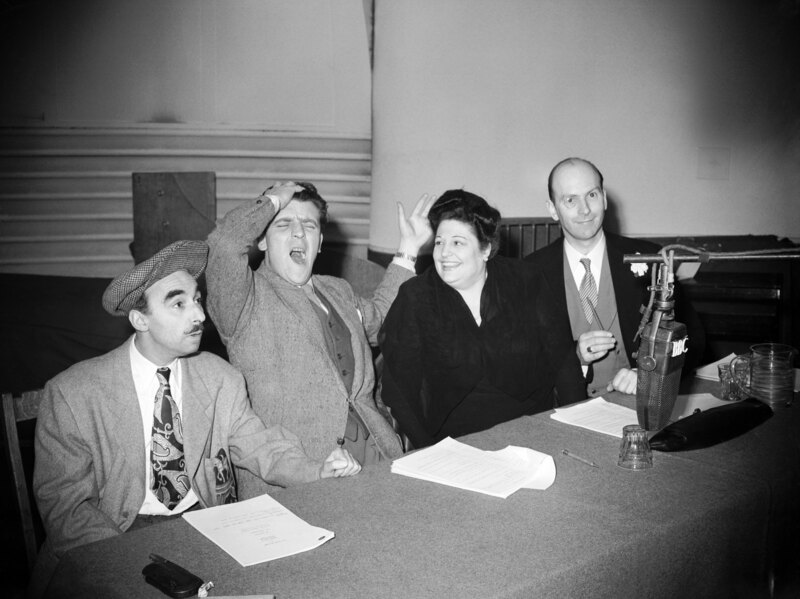 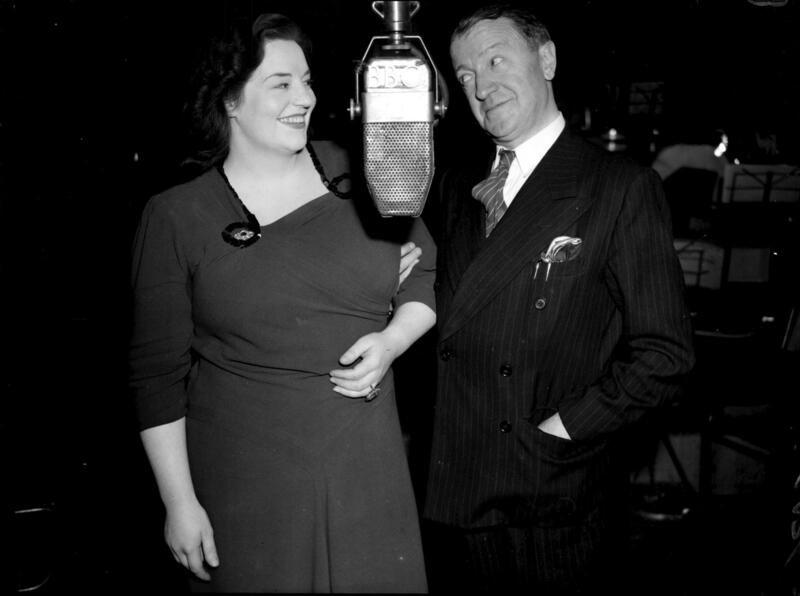 Tommy Handley and Hattie Jacques, during rehearsals for the radio show “ITMA” in London, 25th September 1947. 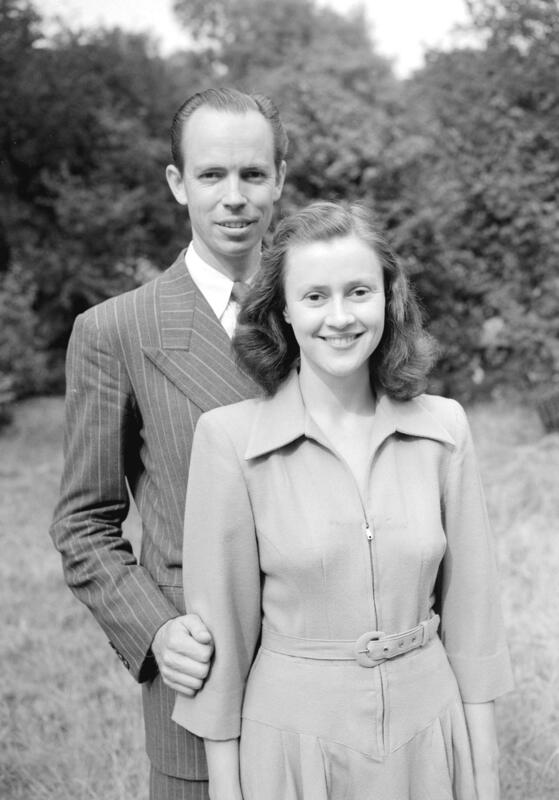 Handley would die of a cerebral haemorrhage two years later. 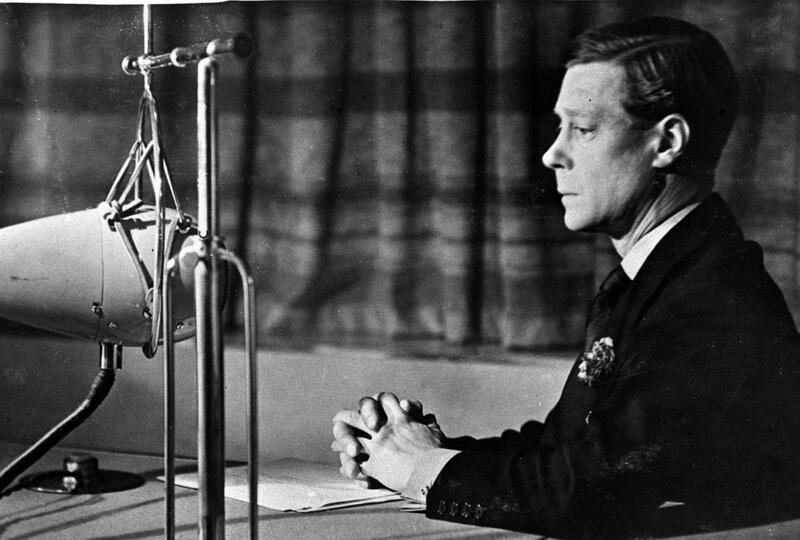 King Edward VIII at the microphone after telling Prime Minsiter Satnley baldwin that he intends to marry the American divorcee Wallace Simpson in 1936. 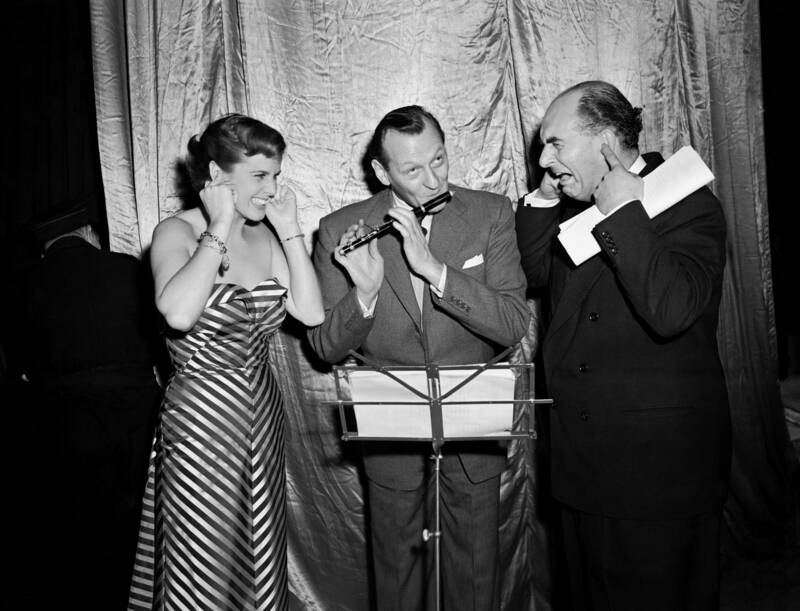 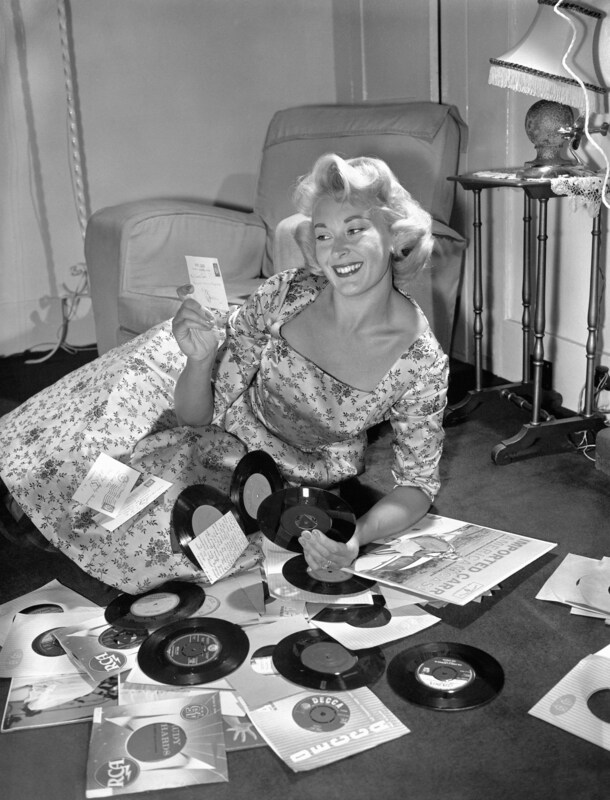 Vera Lynn on stage at Grosvenor House, London, for the 1949 National Radio Awards presented to popular broadcasters. 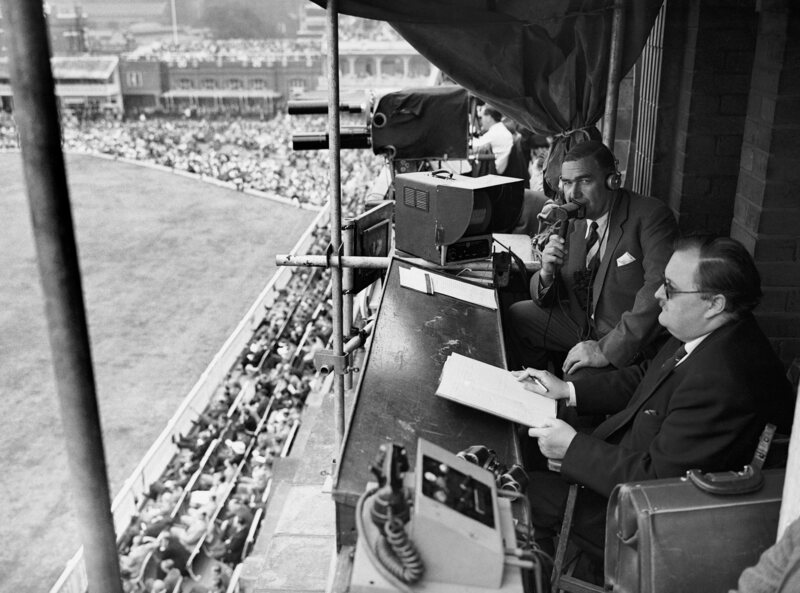 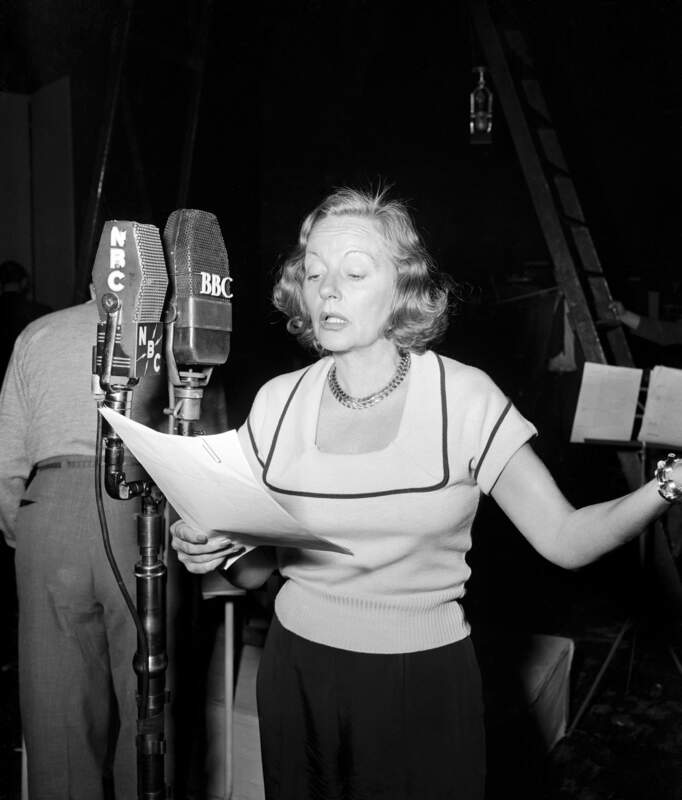 Microphone and umbrella in hand, Manchester born broadcaster Jessica Dunning makes an outside broadcast (from a position near Buckingham Palace) in an audition for commentators for the Coronation. 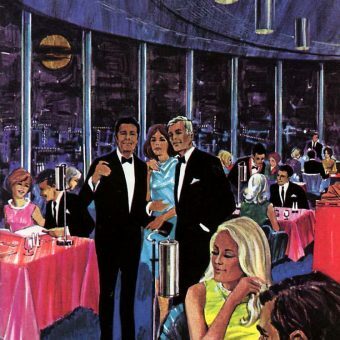 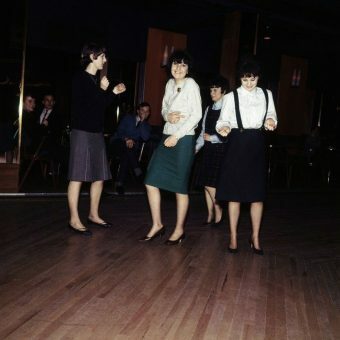 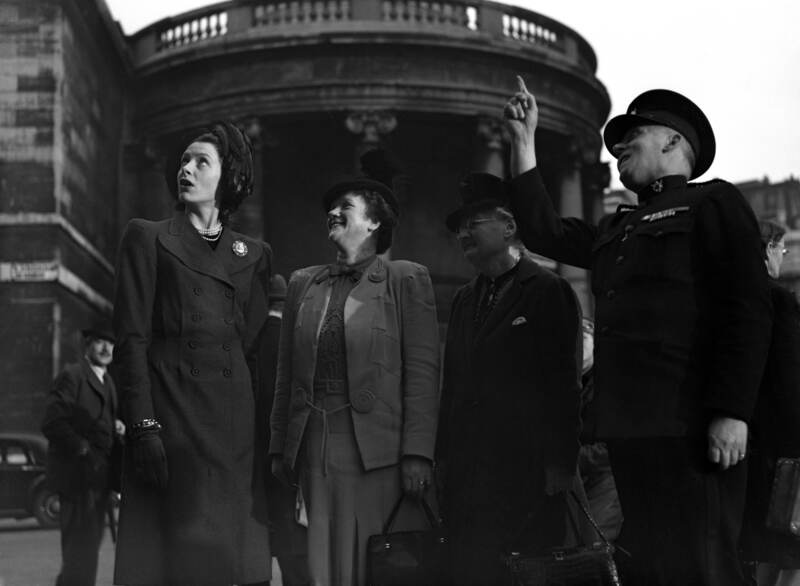 It is thought women may be better able to handle some aspects of the day’s ceremonies. 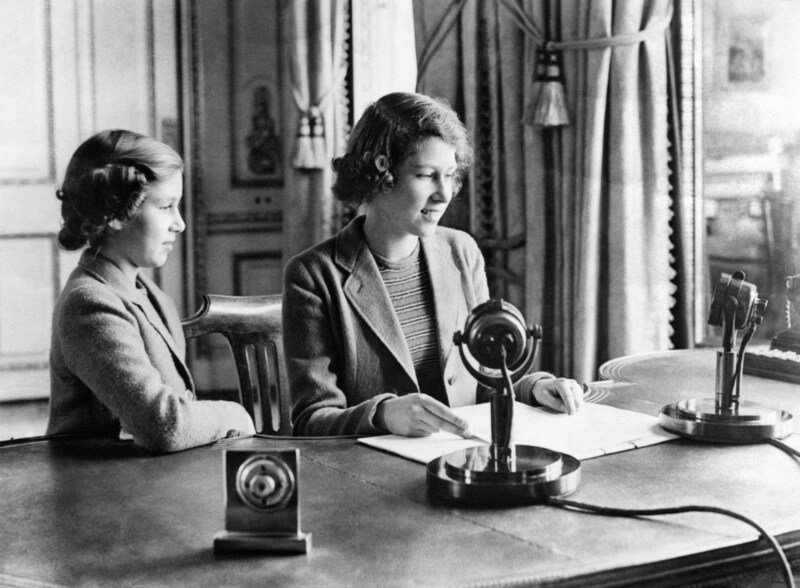 A wartime picture of Princess Elizabeth (right) and Princess Margaret after they broadcast on “Children’s Hour” from Buckingham Palace. 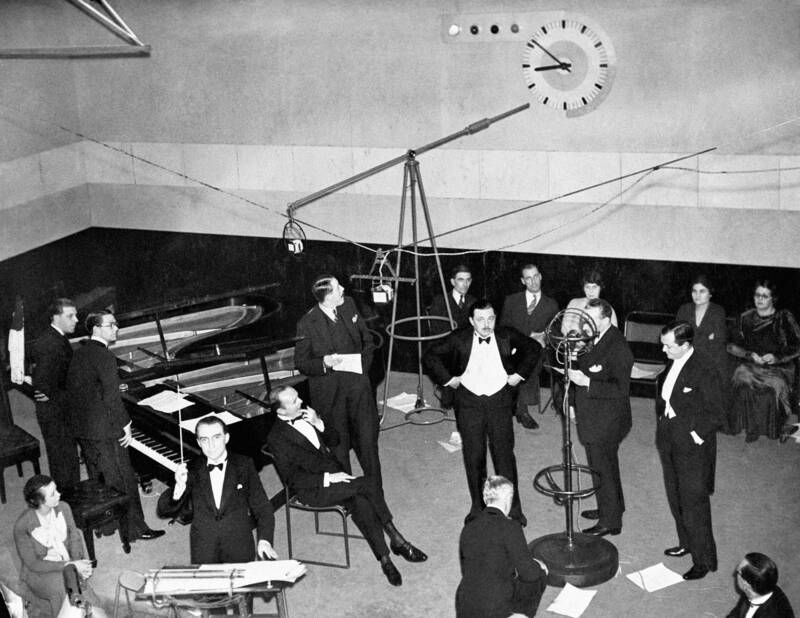 1933: A scene in a 1930s BBC recording studio showing Christopher Stone, wearing a dinner jacket, bidding listeners ‘Good Evening’. 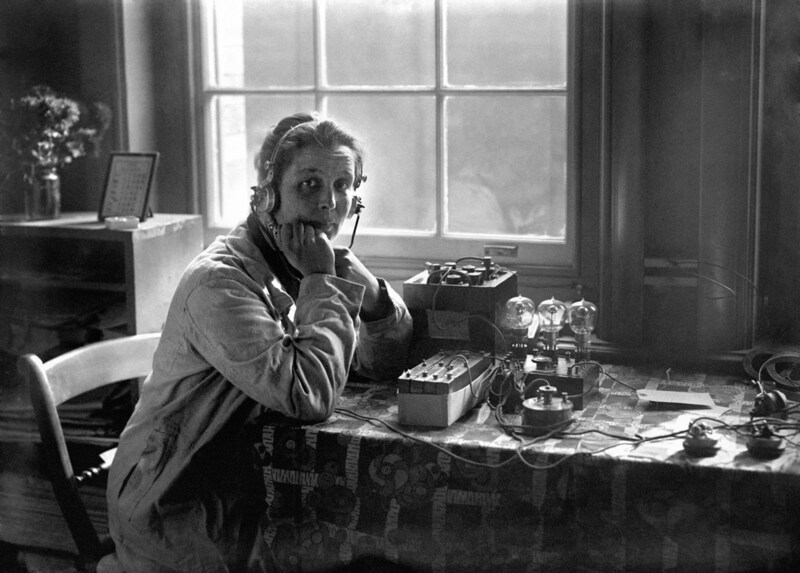 A portrait of a Miss Partridge who Assembles wireless radios in her home in Exeter.